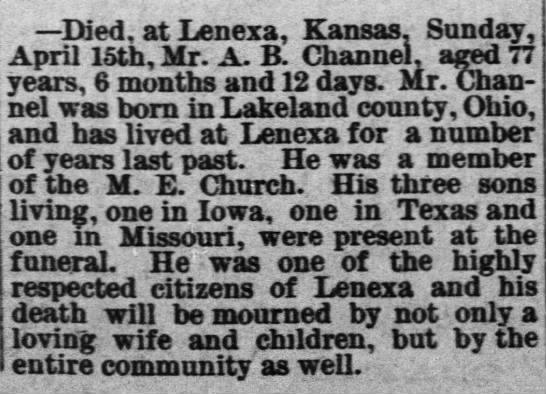 Died, at Lenexa, Kansas. Sunday, April 15th, Mr. A. B. Channel, aged 77 years, 6 months and 12 days. Mr. Channel was born in Lakeland county, Ohio, and has lived at Lenexa for a number of years last past. He was a member of the M. E. Church. His three sons living, one in Iowa, one in Texas and one in Missouri, were present at the funeraL He was one of the highly respected citizens of Lenexa and his death will be mourned by not only a loving wife and children, but by the entire community as well. Please share your memories of A.B..